In this episode our CEO and Co-Founder, Bjoern Zinssmeister interviews Erik Berlin who is the CEO of Breaker. Breaker is a social podcasting app. Erik and his team believe podcasting should be easier to share with friends. In the Breaker app, you can easily see what your friends are listening to, “like” an episode, comment on the episode and then share it. It’s what every other podcasting app is missing. The idea for Breaker first came to Erik while at Soundcloud. Erik believed podcasting had a lot more room to grow so when Soundcloud began to move away from podcasting he knew that was a bad strategy. Erik Berlin talking to Bjoern Zinssmeister at the Templarbit office in San Francisco. When Erik’s current co-founder, Leah Culver, reached out about working on a podcasting app, Breaker was born. After some months building an MVP as a side project, the two decided to go all in and found a company based around the app. Erik and Leah participated in Y Combinator’s Winter 2017 batch and their team is located in San Francisco. Erik’s career as an engineer turned CEO spans 10 years including time in San Francisco and Berlin. Before Breaker, Erik spent time at Instacart and Soundcloud as a software engineer. Learn more about Erik Berlin at Breaker.audio. You can also download the Breaker app on the App Store. Breaker is coming soon to Google Play. Even if they’re capable of doing a lot of dev ops stuff and even if there’s new tools like Docker and all that stuff that speeds it up, it still isn’t as fast as Heroku. And you just don’t have the money to bring in another engineer that is mostly focused on dev ops. Yeah. You don’t have the money, you don’t have the time and it doesn’t matter. I mean your customers, who are using the product, have no idea what your server infrastructure looks like all they care about is the product. Welcome to episode 2 of the Engineering Hangout presented by Templarbit. I’m Chris and I’m part of the team here at Templarbit. 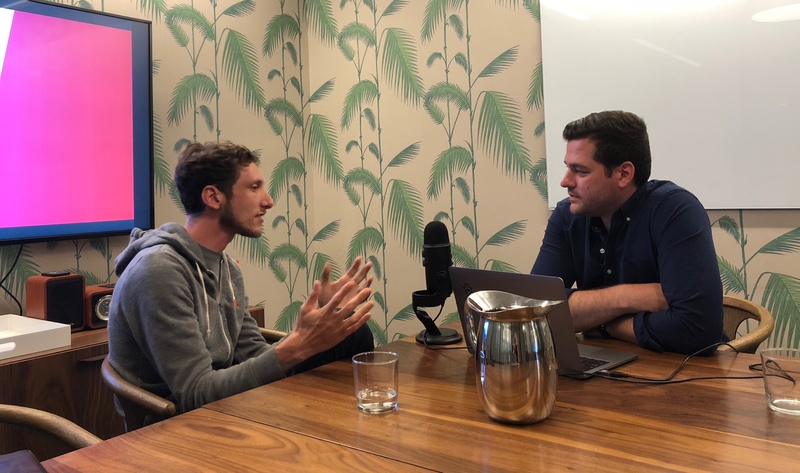 On today’s episode we have our CEO and co-founder Bjoern Zinssmeister talking to the CEO and co-founder of Breaker, Erik Berlin. Breaker is a podcasting app. But it’s more than that. It’s more social than other podcasting apps. Because of that, it’s one of our favorite apps in the office so we were really excited to be able to talk to Erik and learn more about Breaker. Here is Episode 2 of the Engineering Hangout featuring our guest, Erik Berlin. It’s always the CEO who goes last. Exactly. And then what I got and what I really really liked are like some of your cool features around like speeding up, listening to podcasts helps me out a lot as a CEO because time is a concern. Yeah for everyone not just CEOs, for everyone time is their most vital resource, we try to respect people’s time. That’s great. Yeah I can I can tell and there’s a lot of iteration on that feature too. This is awesome. So I’m pumped to have you here. You also did YC just like me. So I think we have a lot to talk about so I’m going to jump in and ask some questions and we’ll see where it goes. Cool. The very first thing I wanted to know is walk me through through the founding story of Breaker. Who did you found with? Why did you get into that space? You know podcasting sort of has this kind of renaissance I guess and I’m sure you have some great insights but like what was the experience like coming up with this and why are you passionate about podcasting? Yeah. I have a great co-founder, a fellow engineer, Leah Culver who started a couple companies before this one and she and I have been friends for years and she was always on my short list of people who if I was going to start a company I would want to start a company with. So you had a shortlist of potential co-founders? I do. You know when I meet really interesting, brilliant people I think that I want to work with them again. I just sort of it’s you know I don’t I have it written down anywhere, I just sort of make a mental note. Oh yeah that’s that’s a good. I probably should write it down to be honest. I think that’s clever. I tell a lot of younger engineers that come to the valley and you sort of see their ambitions and they want to found at some point the very first step is to network and find people that you could potentially found in the future. Yeah I mean everyone says this but it really is true the founding relationship, it’s such a big commitment. It’s really important that you have a good relationship. You know very open, honest, you work well together and there are complementary skills. You just don’t want to found a company with the wrong person. So Leah I’ve known for years and over the years we got to know each other better. We had never worked together. And so when I was still working at Soundcloud, this was late 2016, she sent me an email saying what do you think of podcasts? Because I had been working at Soundcloud I’ve been thinking a lot about podcasts. Soundcloud was sort of at this point where it was actually moving away from podcasts which I thought was a bit of mistake strategically for the company. I thought that was kind of this really new exciting growth area. You know music everybody knows about music it’s not really growing in any meaningful sense other than the population. Right. The other thing legally it is a minefield. Where as podcasting it’s this new thing and you can sort of define what it’s going to be. And the business models and all that stuff I think haven’t really been figured out yet it’s more kind of day one first thing in podcast versus, or maybe second, but early in the game. And you know the music on the other hand has been around forever. I mean almost literally forever. Like for as long as there was humans probably from it you know before there was a language there was music right. So you know it’s a much more developed business. That said I think podcasting fundamentally sort of storytelling is as old as humanity. And so in that sense it’s like just as primal of a media but the actual businesses around them I think are much less developed so there’s a huge opportunity. And then walk me through this. The day you guys got together like where were you guys? And so she sends you an e-mail she says how about podcasting, you probably go back and forth a little bit right. Yeah I think it was like a one line email. I think she said like how about podcasting and I had been thinking a lot about it. So I just did a brain dump of like everything I had been thinking about. So like long emails going back and forth? What was one of your favorites codenames? Oh I’m trying to remember. I knew you would ask that as soon as I brought it up. Yeah exactly, the Japanese fish flag. And I think we looked up what the actual name for that was..
Not sushi, it was another Japanese word that I can’t remember but that was like the first codename. It’s embarrassing I can’t remember. Leah will be listening to this and screaming at her phone. But yeah we had so you know just went back and forth internally didn’t even have beta testers. We were the only users of the app and really it was barely usable. 00:07:25:27 - 00:07:26:17 | Bjoern Yeah. But I think the goal is really to get it to be usable as quickly as possible. And then once it was usable it was like okay. I was using Overcast prior to starting on Breaker. How long could it be before I could delete Overcast from my phone not have to reinstall it. Is there some feature that Breaker doesn’t have that I need or whatever. I think we got it to that, if you want to call that minimum viable product, I think that took about three or four months just working kind of on weekends. You know we would get together and maybe have brunch and talk about what we were going to do for the day. And at that time were you still in Berlin or were you not? Yeah I moved back to the U.S. January 2017. So yeah we started working on it not right away but pretty pretty shortly after that. Then you know once I was using it as my main podcast app then we started inviting our friends and we had a few early beta testers and then really started listening to the feedback and trying to incorporate some of their good ideas and commit to more and more people to use it. Would you say that Breaker essentially started as a side project between two engineers? Yeah we didn’t you know we really didn’t know that we were ever going to turn it into a company or leave our jobs. Leah was working at Dropbox at the time and liked her job there. I was working at Instacart and I liked that job. We really just wanted to see one like you know we were friends but we had never worked together before so we wanted to see how well we work together and we wanted to see if we could build something that was really you know different. We built something that we thought was cool. But then you know if we start giving it to our friends would they just use it for a week and then go back to what they were doing before. Or would they actually stick with it and keep using it. And so well as we’ve shown it’s more and more people and they stuck with it and used it and gave us feedback. And the product got better and better. That’s really what gave us the confidence to turn it into a startup. No, we didn’t intend for it to be that. It really was just a hack project. And when you turn it into a startup like you made that decision. Walk me through the time and place where you guys were and you looked at each other you’re like we should do a C corp and then what. Yeah. You know it’s like we built this thing and we’re like oh this seems pretty interesting you know and then other people, we showed it to other people and they thought it was interesting too. …and start it. So we were sort of optimistic that we would get into YC just because Leah had a great relationship with you know having gone through it before. But you know it’s very hard to get into. Certainly not a sure thing. And for us you know we thought the best way to show our conviction that we really believed in the idea was to kind of leave our cushy day jobs and you know free lunches and all that stuff and and go all in and really commit ourselves to the project. Yeah I think that’s where stuff gets real. Right. Like I see it actually pretty often around here in the Bay Area. Even like where people have side projects a couple engineers get together. But then when it comes to actually quitting that job and leaving the big salary behind it gets tough because rent is ridiculous. You’re never 100 percent sure if you can turn something into an actual company. And so that’s when a lot of teams fall apart. And that’s a huge difference from what it was like maybe 10 years ago when I first came to San Francisco where people would more be more naive I guess about leaving jobs and just like going for it because rent was a lot cheaper. And the jobs weren’t paying that much in the first place. Yeah I mean I also moved here around 10 years ago. So you have also witnessed that kind of change? I remember thinking San Fransisco it’s like oh it’s you know it’s the second most expensive city behind New York. And I remember it passing New York. Yeah. And now it’s the most expensive expensive city in the world. Yeah. Would definitely be a great thing. I hope so. I’m optimistic at this point but it’s easy to be optimistic. No I mean I think you still see people, I think the startup dream is still alive you know. To me people still leave their jobs and start companies. I don’t know exactly it’s the same rate it was 10 years ago. These things tend to go in cycles. But you know it could be more could be less. But I think one thing that’s different from 10 years ago is the incumbents are a lot a lot stronger today than they were then. You know when I was first coming up you know the incumbents were Microsoft and Intel and IBM and you know those seem like kind of stodgier, older, slower companies. And you know today you start a company you’re going to be competing with Google and Facebook and Amazon and Apple and these are much more agile companies, they move much faster. They’re much more aware of sort of start up competition and will make strategic acquisitions or just make product changes you know very quickly. Incorporate you know sort of take those threats seriously in a way that sort of the previous generation of companies didn’t. So I do think it is harder to start a company today to really compete with the existing big players just because they’re so much smarter than they used to be. Yeah I agree. It’s just the field has gotten so, I don’t want to say crowded because it gives you a different kind of mental picture of what it’s like out here, but it’s definitely you having incumbents now that are flexible and that can very quickly adapt they also you know kind of seen what not to do from the previous generation. And it’s just a lot harder I think. But it’s also a lot easier to get started a lot easier to build features faster than it did, at least feels to me that way. Oh totally, AWS has been just a revolution in terms of you know the capital required to start a company. And I think yeah I mean I see a lot of smart founders actually raising less. I mean the trend has been to raise less and less money over time. I remember when the first round of capital you raised was called your Series A because you know A because it was the first round of capital. And then you know now that there’s people that raise Seed rounds before their A round. But the seed rounds are now the size of what A rounds used to be. And so now there’s a pre-seed market of people who are trying to jump in front of that. Yeah I think you need way less money to get started and to sort of get to that minimum viable product. I mean if you do it the way Leah and I did we didn’t even quit our day jobs. We didn’t really you know we didn’t take salary. You know other than we had our normal salaries. So it basically cost us nothing, just our time to build that first version of the product. Obviously it’s a bit of a luxury to have. You know weekends free and you know not everyone has that sort of free time to do that. But yeah I mean the housing cost aside, you know that the cost of actually getting started and launching an app today are lower than they’ve ever been. Yeah. Great. Walk me through a typical day at breaker. What do you do? So you like go to your desk, get a cup of coffee, you open Slack, you look at Jira. What kind of tools you do you use? What is what is happening? Very few of those things actually. So I would first say there is no real typical day at Breaker. Everyday, as they are at any startup, I think every day is really different. We try to be you know, internally things are changing all the time in the world around us is changing all the time. Customers are always giving us feedback. We’re iterating on features that we released the day or the week before. And so we try to be really agile and responsive to that and not sort of get stuck in you know quarterly planning. You know why are we doing this? We were doing because three months ago somebody thought it was you know we all decided this is what we should be doing three months in the future. But the world has changed. So for us our process is a planning meeting on Monday, once every two weeks. Everyone in the company. And we basically just brainstorm ideas. It’s a long meeting. So it’s basically only… It’s the only regular meeting other than one-on-ones that we have scheduled for the company but everyone’s in it and basically takes as long as it needs to. I think we have the conference room booked for four hours. We don’t always use the whole time but sometimes we do and sometimes we can run a little bit over if we’re really struggling to sort of you know debating the priorities. You know what’s the thing that’s going to make the biggest impact for the next two weeks for us to build. And I think it’s important to have everyone in that meeting one just because good ideas can come from everywhere. You know we hire great people at every job. Every role. Yeah. And so you know the engineers we hire we try to hire people who are not just that good at implementing you know writing code but who have ideas of their own. Same thing with our designers. Same thing with our customer service people. You know we have support people who spend all day answering e-mails. It’s very important to have them in the meeting as well because they are really our connection to the users and gathering that constant user feedback so they really hear the pulse of our community and have a finger on the pulse of the community. And I think their ideas again are often the ideas that we decide to implement. So it’s very much in that way you know democratic trying to get good ideas from everywhere but then at the end we vote on priority and difficulty. I know everyone’s surprised by that. It’s an intentional decision. I’ve worked at a couple companies that use Slack. And personally I find it really is distracting. You know the sort of way that I think about slack is it’s a tool where anyone in the company can interrupt everyone at the company whenever they want. And for me my most valuable resource you know as an engineer you know the most valuable thing I can do spending my time when I was spending all my time programming is large blocks of uninterrupted time. You know four or five hours of just you know no meetings, no interruptions, nobody can hear me, nobody’s tapping me on my shoulder no breaks, nothing. That’s when I got my work done. And you know often I would find myself you know working at other companies you know staying until 9:00 10:00 because you know I would start working at 5:00 when everyone else left. And you know people stopped pinging me and the Slack notifications stopped popping up. And so you know for us we try to institutionalize that by minimizing the number of meetings other than this one meeting on Monday and one-on-ones. We don’t have any other regular standing meetings. Obviously, if you need to meet with someone you schedule a meeting with them. We don’t have meetings on the calendar. Other than those and we don’t use Slack, which you know right now we’re an eight person team so still quite small. We’ll see if we sort of hit breaking points on the ways we scale for our current team size, we haven’t needed it and I think we’re actually a lot more productive without it. Cool. I want to switch gears a little bit. You already talked a little bit about your time in Berlin. You work at Soundcloud. You worked at Instacart and now you running your own show. And I want to know like from your time in Berlin at SoundCloud and your time here in San Francisco, what do you think are some of the cultural differences like working for a European company versus a San Francisco company or are there none? There are some for sure. You know I lived in San Francisco, so I first moved to San Francisco in 2005. Basically been working at different start ups my whole career. So I was I was in San Francisco before I moved to Germany and now I’m back in San Francisco. When I lived in San Francisco before I moved to Germany, I had this idea that you know the best engineering talent was sort of within a 50 mile radius of San Francisco. And you know when I when I move to Berlin I would be one of the best engineers there. And you know the talent just wouldn’t be there and I was completely wrong. One really nice thing about working in Germany is much better immigration policy than the U.S. does. And so there were able to recruit from all over Europe and really all over the world. I mean obviously they recruited me and a number of other people from America and actually there were more Americans at Soundcloud than any other nationality including Germans. But there were people from all over from France and Spain and Portugal and Poland and Russia. And you know Australia, the U.K., Canada, from Brazil. I mean really covered the entire globe and I worked with some unbelievably talented people. The founders of Soundcloud actually aren’t German or Swedish. And so you know they also you know I think part of the process of founding the company for them was kind of acclimating to a new country. And so they really built that into the culture and tried to make it a very, they looked outside of Germany for when they were hiring and did a really good job integrating those people into this sort of Soundcloud and into Germany and the culture there. So I think Soundcloud is really an exceptional company. I don’t know that that’s normal. I think you know now having started a company and doing fundraising going through things like that. European investors there’s definitely a different profile. You know Soundcloud raised most of its capital from Silicon Valley investors and sort of understandably so. So I think you know most most European investors and German investors in particular you know, to paint with a broad brush stroke of course there’s exceptions, but in general it is much less appetite for risk especially if you’re building a consumer company that doesn’t have any revenue and won’t have any for a long time. You know you’re just kind of burning through capital to grow users and kind of build up, you know grow as fast as you can. Build a little mode in terms of just building a network in fact and having as many users as you can. But no revenue. I think there’s much more appetite for those types of companies here in Silicon Valley than there are in Germany or in Europe, more broadly. I think you know again there’s exceptions and we actually have seen European investors who we love and are great and willing to take a risk on us. But in general I would say that’s that’s a fair characterization of the different investment landscape there. And so Soundcloud is bit of an exception. And they were able to raise outside capital from outside of Germany and outside of Europe. But it can actually be I think for a lot of companies in Europe that it can sort of stunt their growth and grow more slowly or focus on revenue sooner and so you see fewer sort of companies like Facebook or Amazon which you know go you know years or even a decade without any revenue or profit to speak of. Amazon has that revenue but you know companies like Google and Facebook went many years before they even had revenue, before they had a business model. But obviously that worked out quite well for them. So maybe it’s fair to say that in general the climate in Berlin or Europe in general is a little bit more realistic. Like I so you want money for a business, well what’s actually the business. It’s more like a bank I would say. You went to the bank and ask for a loan. There’s just less risk tolerance and I think it’s actually justifiable because they have seen fewer successes in Europe. There haven’t been as many Facebook and Googles in Europe and so you know they haven’t seen that model succeed. They haven’t had those returns to reinvest in those type of companies and so they’re understandably cautious. Yeah yeah. Yeah I feel that way about it actually. Cool. One last question for you. Picture yourself doing a brand new project. You’re starting a piece of software. What are some of the development tools that you would definitely use? Maybe one or two that you can’t live without. Obviously not slack because you can live without it. But what are some of these tools that you would bring to help you build that piece of software? I know it’s a general question. Probably depends on what kind of software. But let’s assume some type of app or an enterprise SAAS and like you bring some tool that you can’t live without. And even taking notes like I’m in a meeting and I have my laptop open I’ll take notes in VIM. Just because I’m so fast with it and using it for years and I have my you know it’s very well configured. My VIM RC file, you know, I’ve compiled it for over 20 years of programming and if I lost it, it would take me another 20 years to build it backup again. It’s very well backed up. So you know I don’t know maybe that’s not an exciting answer to the question. I mean one tool that we used building Breaker that I wouldn’t want to do Breaker without is Heroku and I talked about Amazon Web Services earlier. Heroku’s obviously built on top of that and it really just means that a lot of the sort of operational side of you know setting up servers and kind of scaling up and scaling down and you know running background processes and things like that in the cloud are incredibly fast and easy to do. And you know I am old enough you know I remember when you had to buy and rack your own servers if you want to setup a data center basically, if you wanted to launch a website. And the fact you don’t have to do that anymore it’s easy to take for granted. But it’s indispensable. I really think the layer of value that Heroku provides on top of AWS is making it that much easier to point and click to do your servers. Just the way everything integrates to their add-on marketplace and things like it really meant we spent more time focusing on the product and less time struggling almost no time at all to be honest, struggling with that stuff. And you know even now we’re still reaping the benefits of this. Like if I need to you know clone a database and something like that’s just a couple clicks. We find that really it’s just a great tool. Yeah you don’t have the money, you don’t have the time and it doesn’t matter. I mean your customers who are using the product have no idea what your server infrastructure looks like. All they care about is the product. And so the less time that you can spend on that infrastructure as long as it works. Obviously it has to work but as long as it works then that’s all that matters really. And Heroku works great. So we’ve been very happy with that. I’d recommend it to anyone, especially at a very early stage. I think at later stages, the costs I think it might make more sense to move on to just pure AWS or have your own datacenter. But I actually think that most companies make that leap too early the gains in you know just kind of outsourcing the ops side of development to Heroku is really valuable sort of well into the majority you know even after a company has found product market fit. And I’m still a fan of VIM. I mean really I think you know in some ways things change, a lot and there’s new technologies all the time. In some ways a lot of things don’t. You know we’re still using a traditional you know Postgres relational database to store all of our user data and things like that. Not exclusively, we use some other systems as well. You know it’s like I always say to people like you everyone I mean you know even you know business analysts customers or people just like learn SQL because it’s easy to learn and it’s one of these skills that you learn today and you will be using for the next 20 years. I’ve been using it for the past 20 years and continue to reap benefits from it. So yeah I think in some ways you know I always say that I’m a technologist and engineer at heart. And I really always do try to keep an eye out for new technology to be honest like when you’re a startup there’s so many risks, there’s so many ways the company can die. The last thing you want to do is add a technology risk of using an unproven technology where you know if your thing is successful maybe you’re the biggest customer in this technology. So you know we use technologies like React which you know came out of Facebook and you know it operates at Facebook scale so I think we should be good for a little while. I mean maybe we’ll outgrow Facebook but probably not in the next year or two. So yeah we should be okay. So yeah I think that’s you know the thing that makes a company great I think is, there’s a lot of things obviously, the you know the thing that your customers care about is the product not the technology. And as an engineer it’s really easy to get caught up on you know interesting new technologies and ways to do things and it is interesting and it’s good to follow and a lot of my free time I spend reading about those but when it comes time to actually make decisions for the company I usually go with the kind of battle tested safe decision just because there’s so many other risks why add technology risk on top of that. Also a startup is a really bad place to try something experimental that you’re not familiar with because you’re trying to push stuff out fast. Good luck finding that if you’re using something that’s really cutting edge. You know it’s sometimes that can actually be great for attracting people who are like early adopters but if you really need to hire a large number of people quickly and you are using some cutting edge technology it can be very difficult. So I think there’s a lot of reasons to sort of play it safe with technology choices and allocate your risk in other areas of the business. Erik thank you so much. Bjoern. Hey, thanks so much for having me. Real pleasure to be a guest on the show. So happy to hear that you’re entire team is using and loving Breaker and I hope your listeners will check it out as well. And I can’t wait to listen to this on Breaker. That’s it for episode 2. I want to thank Erik Berlin for being our guest today. You can find out more about Erik and Breaker at Breaker.audio or search Breaker in the App Store or Google Play. You can subscribe to the Engineering Hangout on Breaker, Apple podcast or anywhere else podcasts are found. On behalf of the team here at Templarbit, thanks for listening.